​2012/05/24 Deborah Lee at the U.S. Army Corps of Engineers (USACE) reported Sherry Chen, an employee of the National Weather Service (NWS) as a “Chinese National” for security allegations to the USACE Security Office. 2013/06/11 Sherry Chen was interrogated by two Department of Commerce (DOC) investigative agents for 7 hours without informing her that she was the target of investigation and without the presence of legal counsel. 2014/06/03 DOC investigative agent Andrew Lieberman submitted a misleading “Report of Investigation” which was later found to alter and omit exculpatory evidence. 2014/09/22 National Oceanic and Atmospheric Administration (NOAA), an agency within DOC overseeing NWS, announced the promotion of Deborah Lee into a Senior Executive Service (SES) position. 2014/10/20 Sherry Chen was arrested by 6 FBI agents in her office. She faced a maximum of 25 years in prison and $1 million fine. 2015/01/15 The government issued superseding indictment and doubled down on the charges and potential penalties against Sherry Chen after she pledged innocence to the original charges and her lawyer Peter Zeidenberg filed motions pointing out fatal flaws and factual errors in the case. 2015/03/11 All criminal charges against Sherry Chen were dropped without explanation, redress, or apology to her. 2015/09/04 Laura Furgione represented DOC and initiated proposal to terminate Sherry Chen’s employment at NWS. 2015/12/18 Louis Uccellelli resigned his role as the DOC deciding official after Sherry Chen and her lawyer Peter Zeidenberg presented both written and oral appeal against the proposal. Michael Devany was named the new deciding official. 2016/01 In subsequent MSPB hearings, Michael Devany revealed that he had announced his retirement from DOC during the second week of January 2016. 2016/03/11 Sherry Chen was fired from her job despite a second appeal from her and Peter Zeidenberg to Michael Devany about the flaws and errors of the proposed disciplinary action. 2016/07/01 Michael Devany went on leave in April and officially retired on July 1. 2016/10/06 Sherry Chen and her attorney Steve Simon filed an appeal to the Merit Systems Protection Board for wrongful termination of employment, racial discrimination and retaliation. 2016/12 Laura Furgione transferred to the Census Bureau. 2017/03/14-28 MSPB held a public hearing on Sherry Chen’s appeal in Cincinnati, Ohio, to be followed by a video hearing on March 28. Steve Simon represented Sherry Chen as legal counsel. 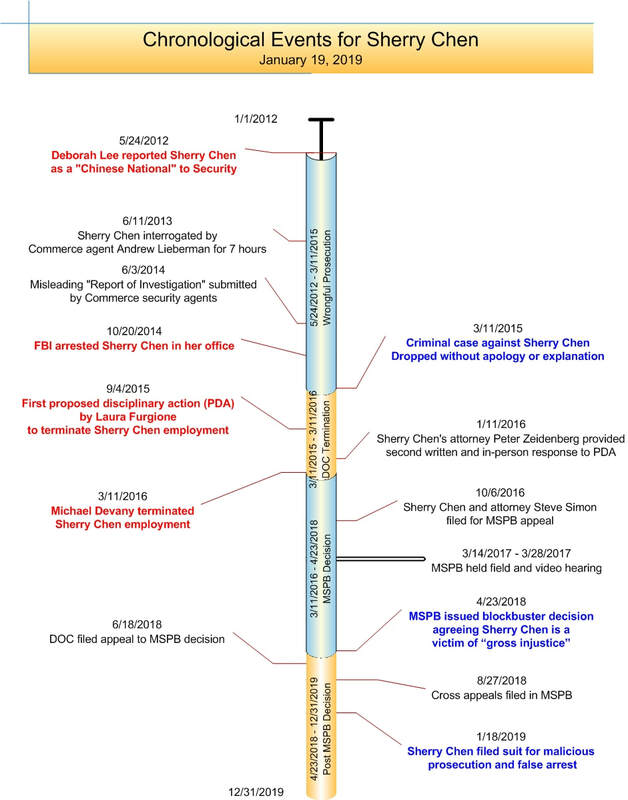 2018/04/23 MSPB Chief Administrative Judge Michele Szary Schroeder issued a 135-page blockbuster decision, concluding that Sherry Chen was a victim of “gross injustice,” reinstating Sherry to her job with back pay and benefits. The judge also found multiple levels of DOC mishandled the Sherry Chen case. 2018/05/15 The Sherry Chen Legal Defense Fund notified the Senior Executives Association (SEA) about the MSPB decision and the role of Laura Furgione, a member of the Board of Directors of SEA. 2018/05/23 The Congressional Asian Pacific American Caucus sent a letter to DOC Inspector General requesting a full and independent investigation of DOC’s handling of the Sherry Chen case. 2018/05/31 The Sherry Chen Legal Defense Fund filed a Freedom of Information Act (FOIA) request for information on the filling of a SES position in NOAA in 2014. The assigned tracking number is DOC-NOAA-2018-001465. 2018/06/18 DOC filed an appeal to the MSPB decision. 2018/08/15 The Sherry Chen Legal Defense Fund turned over a whistleblower letter to the DOC/IG Office to investigate the letter’s allegations of abuse of authority and targeting of Sherry Chen and employees of Asian ancestry in DOC. The assigned tracking number is 18-0999. 2018/08/27 The MSPB filing process was completed after Sherry Chen and her attorney Steve Simon filed a cross appeal to the MSPB decision. 2018/11/19 The Sherry Chen Legal Defense Fund filed an appeal with DOC for a response to FOIA Request DOC-OS-2018-001465, which has exceeded its statutory requirement for a response within 20 work days. 2019/01/18 Sherry Chen and her legal team filed a civil lawsuit, Case 1:19-cv-00045-TSB, Sherry Chen v. The United States of America, in the U.S. District Court in Southern Ohio.